I carry around a day planner in my purse that includes a handy slot for a single pen. However, one pen just isn’t enough! I wanted to have with me a few writing utensils (pens of different colours, a marker, a pencil crayon for shading, etc), but I didn’t want these rolling around loose in my purse. I tend to lose items like these so I wanted a way to keep them right inside my planner. This tutorial is for 5.5×8.5″ planners, but you can easily use the same concepts to make one for any size planner or binder by adjusting the measurements to your taste. Let’s get started! I made mine in neutral grey-green, olive, and white tones, all solids, but you could definitely mix it up by using your favourite prints. Note: If you don’t want to bother with the stripe detailing, simply cut out two pieces of cotton fabric at the base size and skip the front, wide stripe, and thin stripe pieces. For a 6-ring planner, you’ll need 6 pieces cut at approximately 1 7/8″each. If your planner has more or less rings, adjust accordingly. Sewing Machine, thread, straight pins, marking pen, etc. Cut out all the fabrics and ribbon as indicated in the supply list. Iron all the fabrics to remove any wrinkles before starting your sewing. 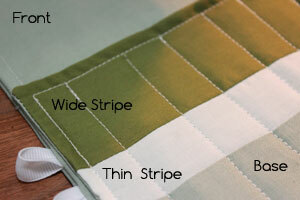 Sew your Wide Stripe and Thin Stripe fabrics right sides together with a 1/4″ seam allowance along the longer edges. Press your seam towards the darker fabric. 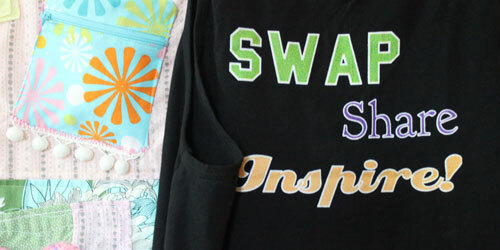 Sew the Thin Stripe to the short edge of the Front piece right sides together with a 1/4″ seam allowance. Press your seam towards the darker fabric. You’ll now have a piece of fabric that is identical in size to the Base piece. 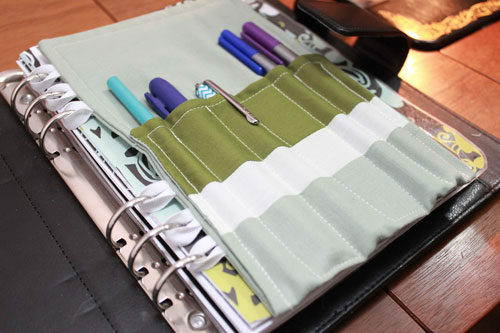 Take your assembled striped fabric and lay it on top of your planner. Align the bottom edge of the fabric with the bottom edge of your paper; the striped part of your fabric should be hanging out the top freely. Take your marking pen or chalk and put a light dot beside each ring to indicate where your ribbon loops will eventually go. I forgot to take a photo of this step, but where you see the pinned loops above, you would put your marking dots. Now for the tricky part of this project: making the loops! Take your ribbon and fold it in half lengthwise. Fold the raw edge again horizontally. The ends will be flattened but the loop part will retain some height. 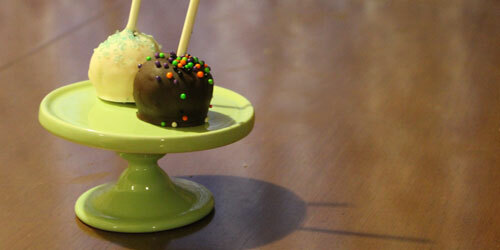 Carefully pin the loops into place using straight pins as pictured below. Warning: this is a bit fiddly! You’ll be happy to know that all the remaining steps are comparatively pleasant. 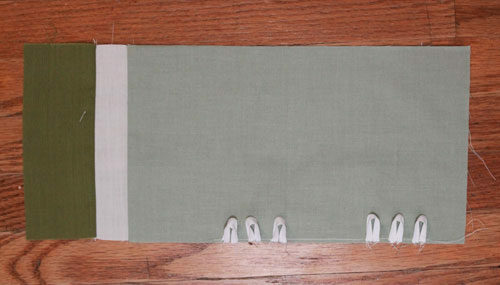 Place your striped fabric right side up on a flat surface with your stripes and loops as pictured above. Then place your Front fabric piece on top, right side down. 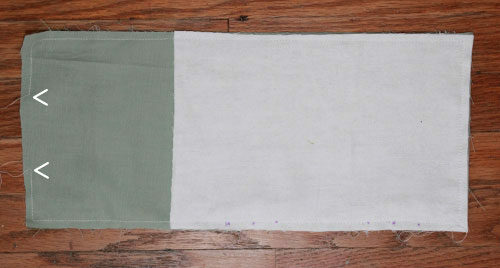 Last, place your flannelette/interfacing on top on the opposite end of your stripes as per below. 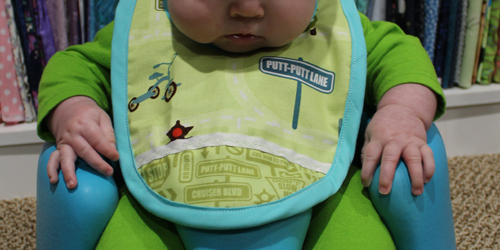 Pin around the perimeter. Snip the corners off outside of your seam to reduce the bulk, then turn your work right side out. Press it flat. Your loops will now be on the outside of your work and all the edges captured inside. 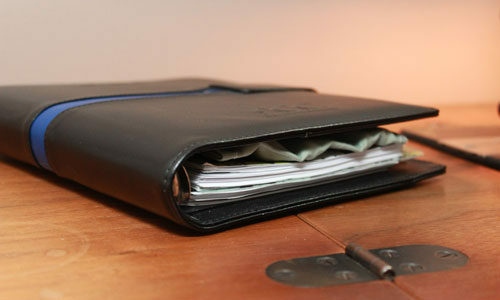 Test out your loops inside your planner to make sure everything is fitting as expected. If it’s good to go, you can either top stitch or hand stitch the opening closed. Some of my loops were a little warbled, but once they were looped onto the binder rings, you couldn’t even tell so I let it slide. 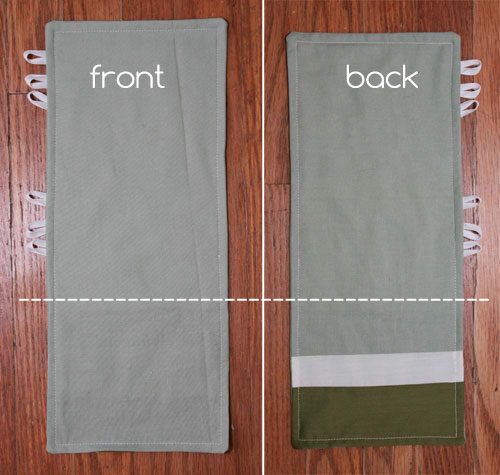 Fold up the striped part of your fabric as per below; it should naturally want to fold where your flannelette ends. Pin it in place. 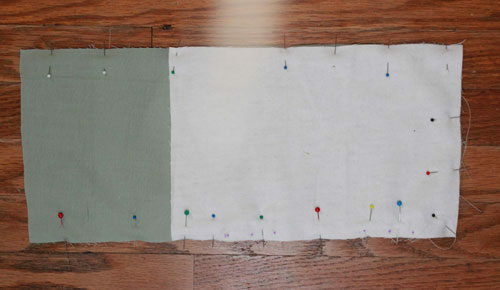 Sew two lines down the left and right edges to create one large pocket. 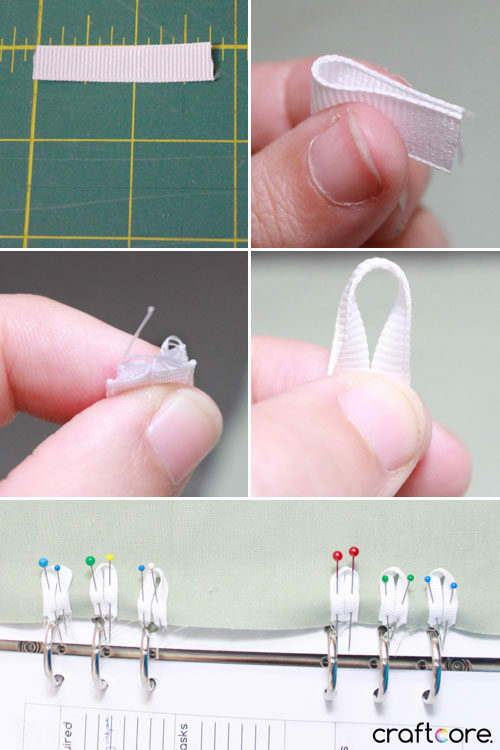 You can subdivide the pocket further by sewing more vertical lines, either evenly spacing them or creating different sized areas for different tools. I like having a pencil crayon with me to shade areas in my planner so I was sure to include some thin slots where smaller writing utensils wouldn’t slide out. 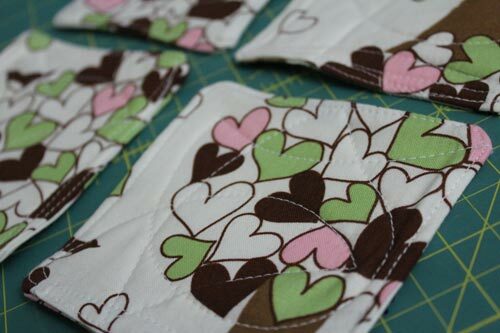 When sewing these vertical lines, be sure to back-stitch to secure the stitches. If you’re using a vintage machine without a reverse switch, you can either shorten the stitch lengths to start and end (see the interesting debate here!) 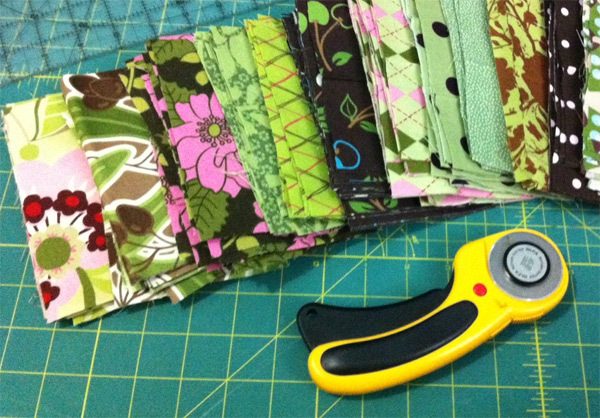 or start sewing in the opposite direction, pivot with the needle in and flip your work around. My planner now holds a thick marker, a pencil crayon, two coloured pens, and a standard ball point pen. I love the flexibility to switch between them on the go! 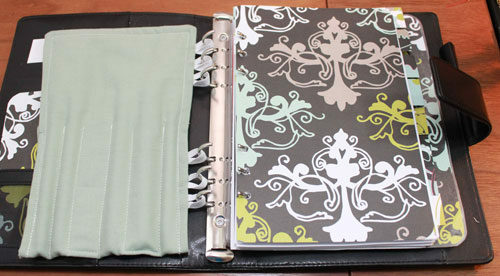 The organizer does add some bulk, so if your planner is full, you might not be able to fit this kind of organizer inside. 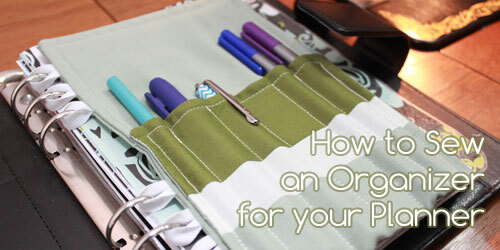 You can easily remove the organizer if you want to place your writing tools in an accessible place while working on your planner. 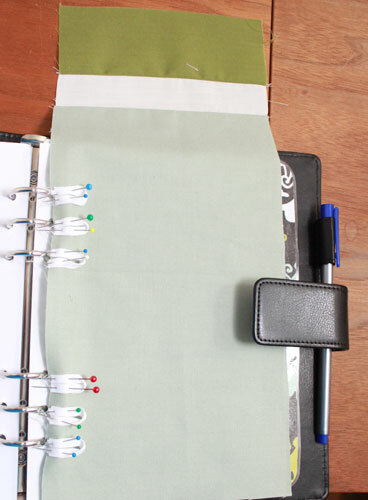 A happy DIY planner organizer with room to grow!